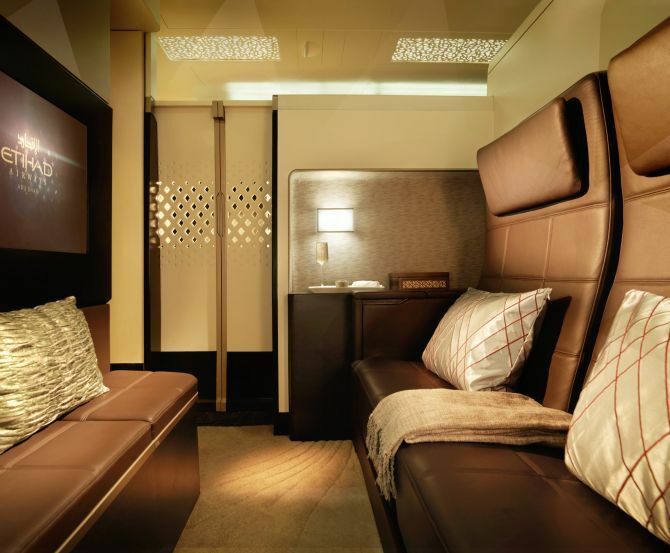 Etihad Airways, national carrier of the United Arab Emirates has unveiled the world’s most luxurious suite on a commercial passenger aircraft. 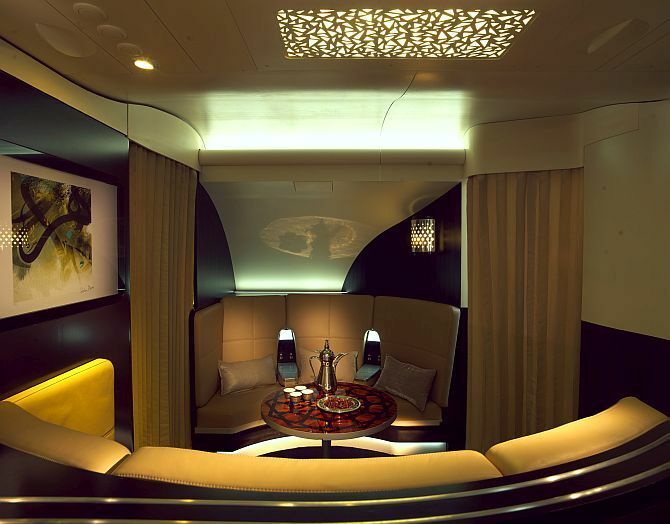 Image: Lounge of the newly launched Etihad's ultra luxurious plane. The opulent ‘Residence’ will feature a living room, double bedroom, separate ensuite shower room, and a trained Butler. 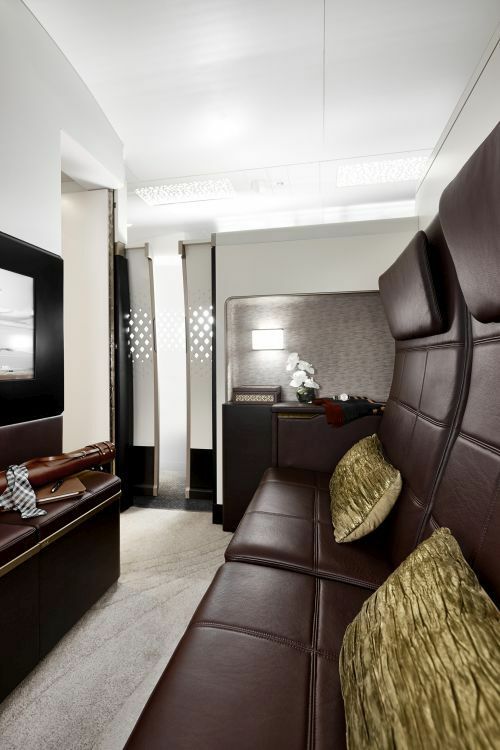 Image: Lobby of the new Residence Class that Etihad unveiled. 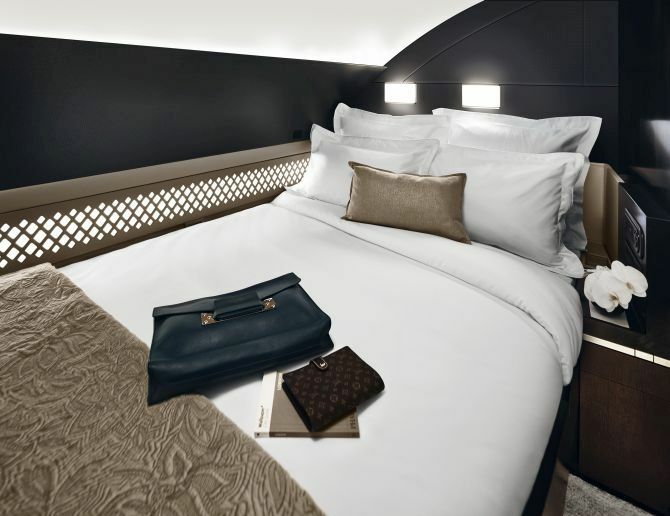 Spread across an area of 125 square feet, the suite will be located on the upper deck of the airline’s new fleet of Airbus A380s and will be available for single or double occupancy. Image: Bedroom that's part of the Residence Class. The living room is furnished with a two-seat reclining sofa, dining tables and a chilled mini-bar. 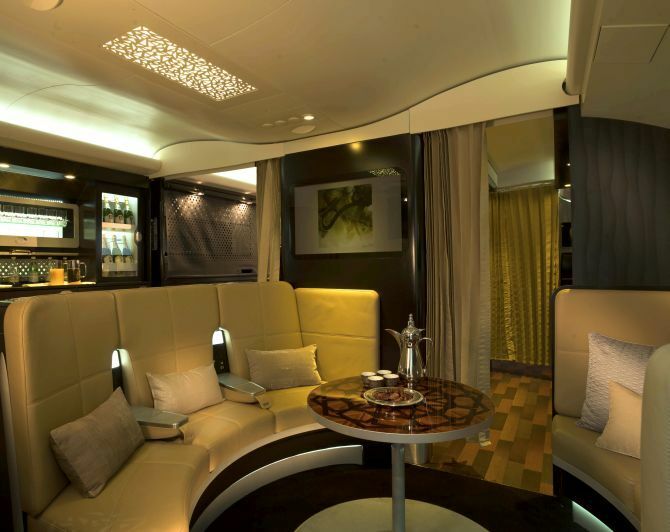 Image: The lounge of the new Residence Class. 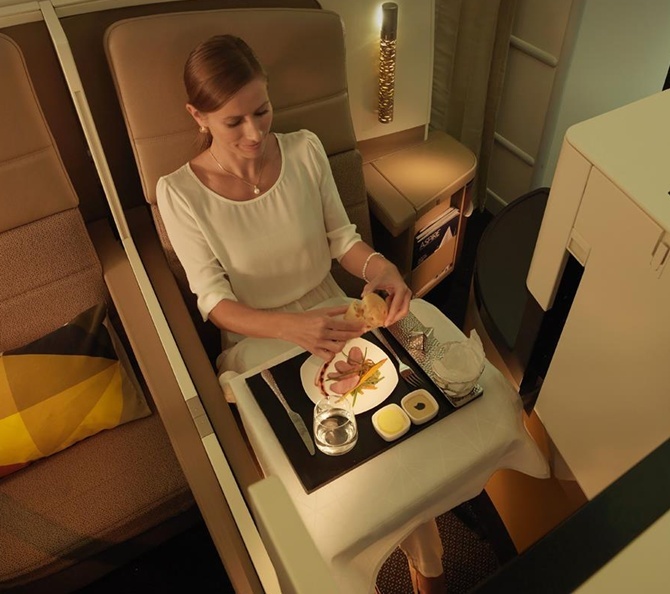 Passengers will have a dedicated Butler on call throughout the flight, offering personalised service. A dedicated VIP Concierge team will ensure all aspects of the experience, including booking luxury limousine transfers, check-in, and menu planning. Image: Bedroom of the Residence Class. 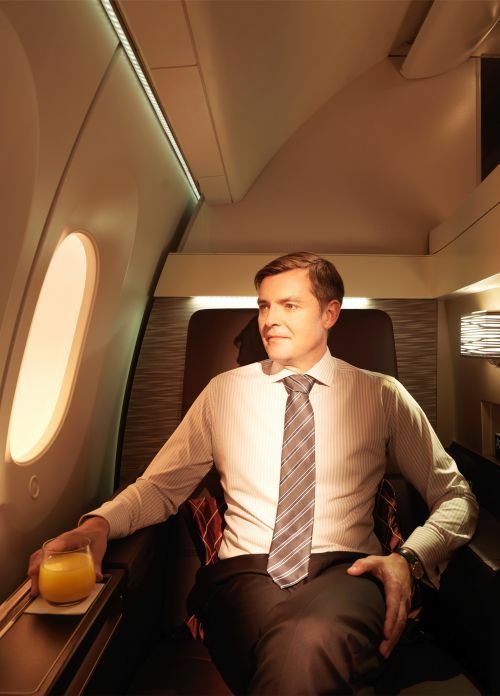 “The Residence will set Etihad Airways apart from the rest of the industry and allow us to provide the complete range of world-class products and services to cater for the individual tastes of every VIP traveler,” Peter Baumgartner, Etihad Airways’ Chief Commercial Officer, said. Image: Sitting area in the First Apartment. A touchscreen control unit operates the retractable ottoman, lighting, window shading, adjusts seat position and firmness, and activates the in-seat massage functions. Image: The lobby of Residence Class. The Residence is decorated in a contemporary style influenced by modern Arabian design. 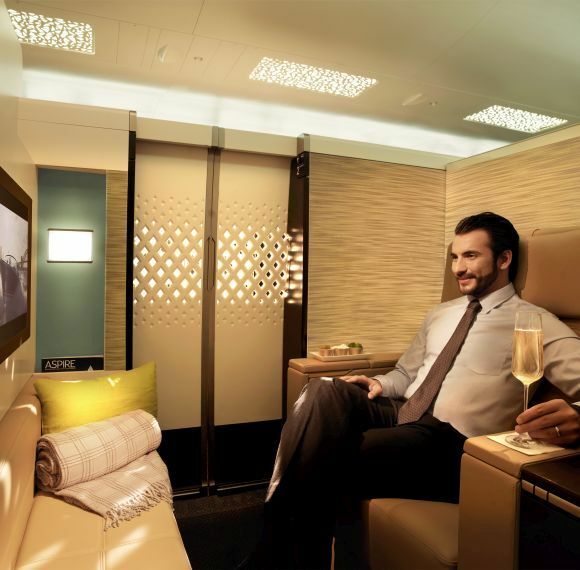 Image: Lounge of the First Apartment Class. 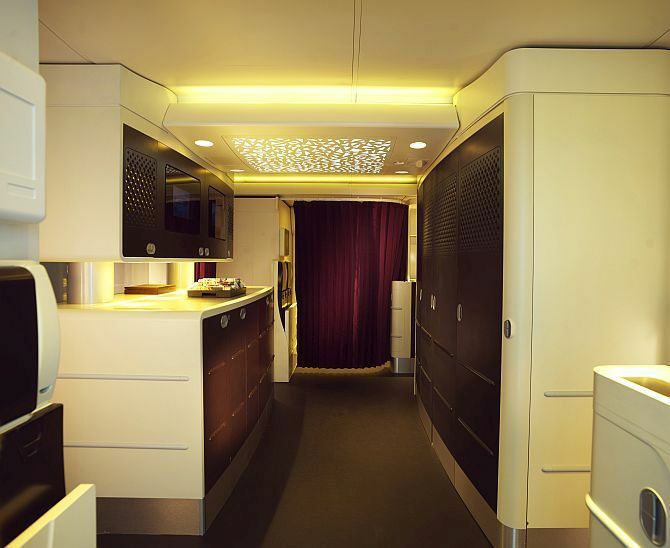 The bedroom features 82-inch long double bed, bedside unit, wardrobe, and under-bed stowage for hand luggage. Image: Bedroom of the First Apartment Class. The living room features a large 32 inch LCD TV, while the bedroom has another 27 inch LCD TV. Image: Vanity room in the First Apartment. The communications suite features broadband with internet mobile and data capability, Live TV, HDMI, AC outlet and USB ports. The Residence is fully Wi-Fi enabled and equipped with the latest entertainment system, controlled by video touch screen and handset. A door and passageway separate the living room from the master bedroom and the ensuite shower room. 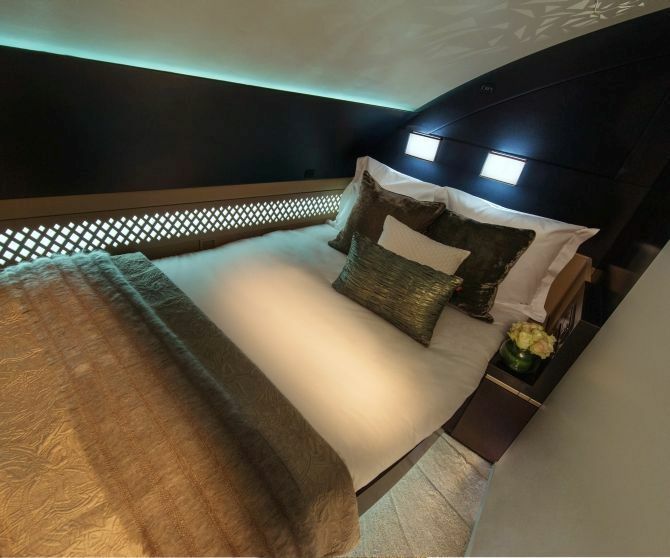 The flight to London from Abu Dhabi will offer this luxury onboard the A380 for about $20,000. Image: Galley in the First Apartment. 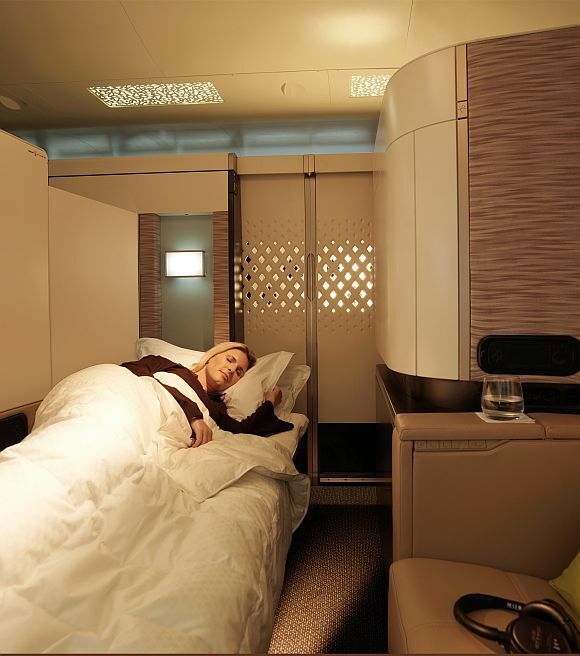 The first flight will connect Abu Dhabi and London in December this year. 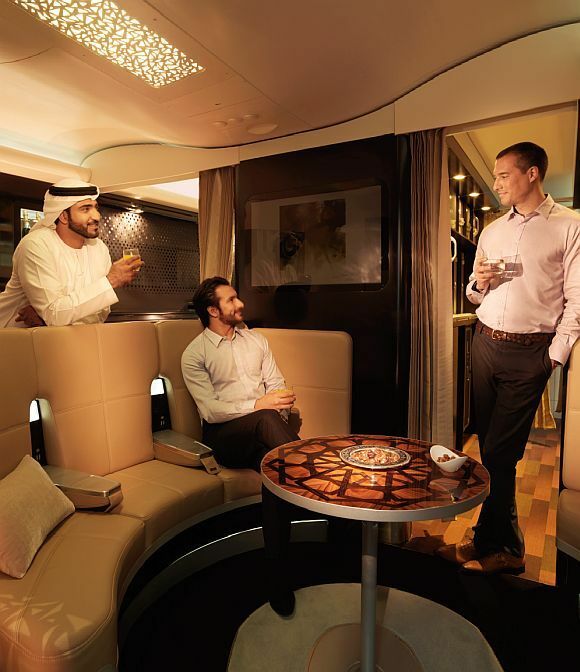 Etihad plans to add 10 Airbus A380s to its fleet. 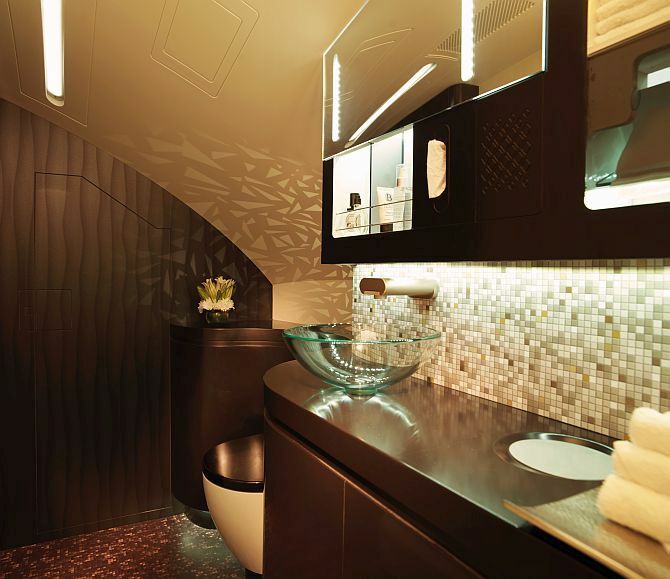 Certified by the European Aviation Safety Agency (EASA) for dual occupancy, ‘The Residence’ has been built by B/E Aerospace partnering with the Etihad Design Consortium (EDC) and Poltrona Frau. 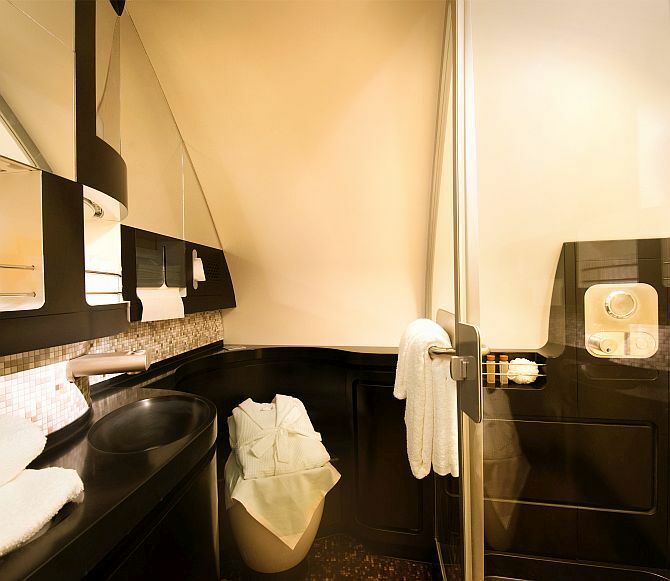 Image: Unlimited luxury in 'The Residence'. 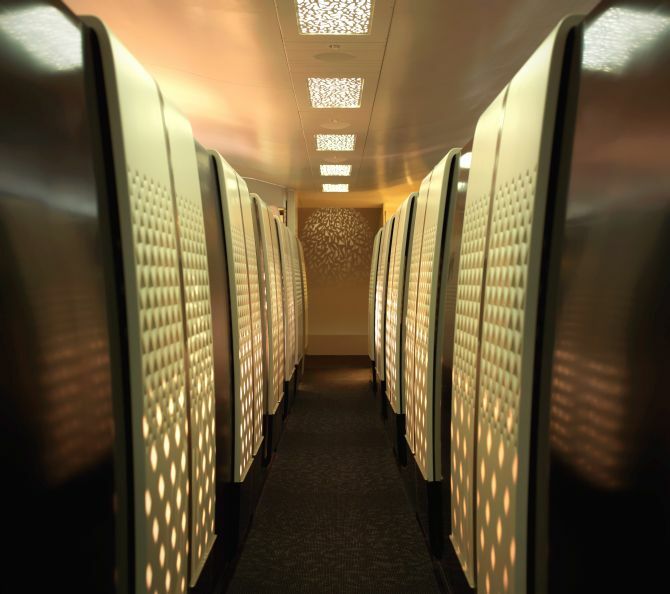 Want to take a shower 40,000ft in the air? Welcome aboard!